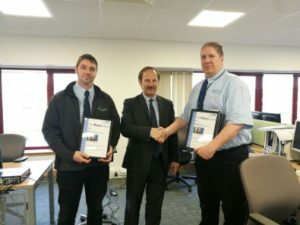 An award was presented to Glanville Environmental Contract Manager Mark Robertson for his teams’ outstanding efforts during the installation of complex infrastructure in a busy Cornwall town. The team developed, in conjunction with the council and local residents, an innovative traffic management system to keep the traffic running through the towns’ complex network of streets over the 7 week construction period. Local business and residents were largely unaffected by the works and not a single complaint was received by Cornwall Council Streetworks, which is almost unheard for a project of this scale.